I can’t believe it has been here and gone. I started planning A Weekend with the Oliviers back in January and now it’s already over. Time flies when you’re having fun! This was the first time I’d ever organized an event like this–let alone an international one–and the first time leading a group of people who were counting on me to share knowledge of something they really enjoy. I’m so happy to say the event was a success! I was worried something would go wrong but it turned out fine and we even had a few surprises! The event itself was scheduled for Saturday and Sunday, but somehow it ended up unofficially starting a day early and unofficially ending a day late. So, instead of two days worth of event wrap-ups, there will be four. Watch this space! 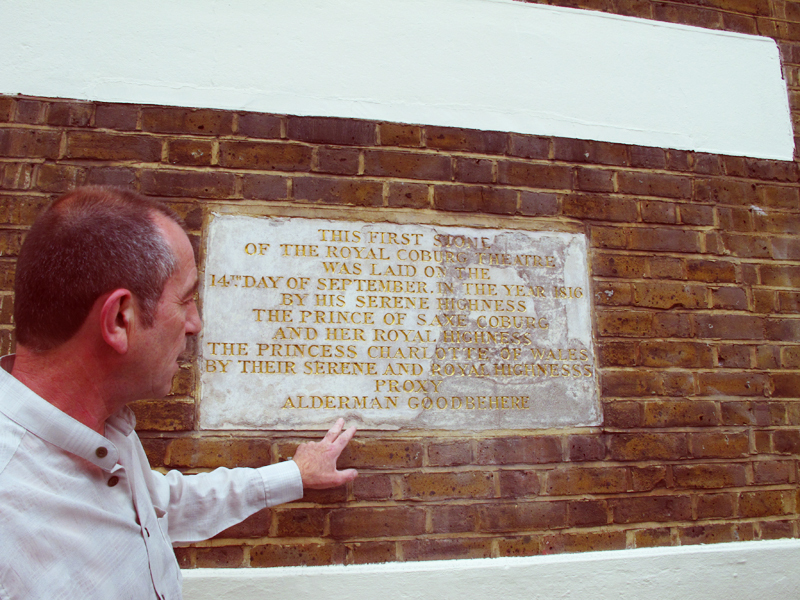 Ned, the Old Vic’s best tour guide, showing us the original foundation stone which was laid in 1816. The best thing about this event was meeting so many like-minded people. I cannot describe the sheer joy of being able to converse with people about something you are so passionate about and have that passion reciprocated. 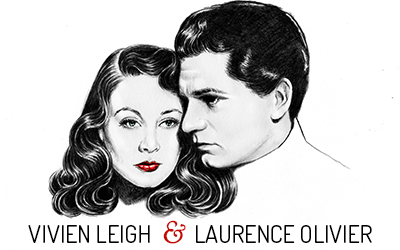 It does not happen enough with this particular subject in “real life.” The fact that many traveled from the US and Europe really shows how far-reaching the appeal of Vivien Leigh and Laurence Olivier remains today. People came from as far as Seattle, Australia, Finland and Italy, and everywhere in between. We had 25 people in all, which was the perfect number (especially for the London walking tour, which was the most stressful part for me), and, considering this was a grassroots event and not publicized anywhere but on this website and facebook, quite a good turn out. The best part was that everyone was really friendly and it seems everyone made new friends. I know I did! Some people I had known for years through Livejournal and classic film message boards, and it was so great to finally put faces to names. Others I had met here in London just recently, and still others I was making contact with for the first time. Our group was really awesome and so enthusiastic! They were also very patient if things ran a bit behind schedule, which I’m grateful for. 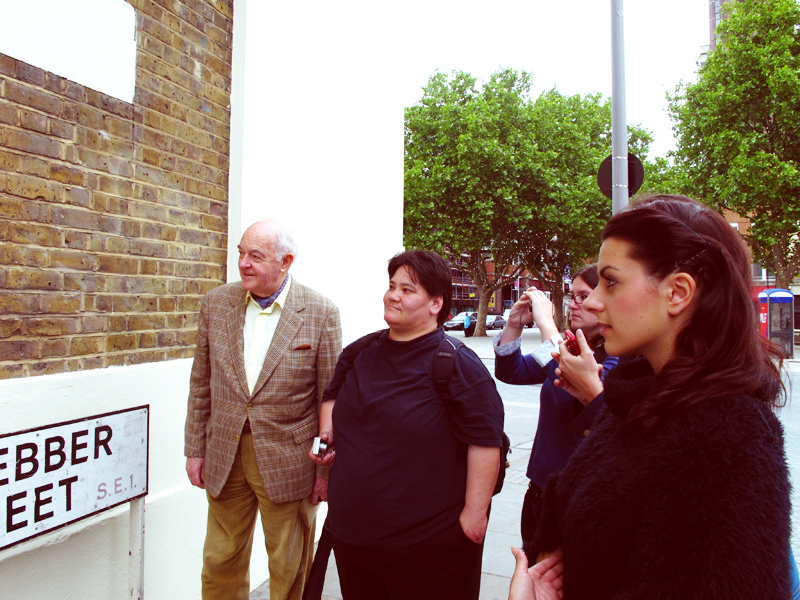 Robert, Christina, Lara, Marissa and Sameera listen intently to Ned’s stories of Old Vic lore. A few people arrived early. On Thursday morning, I met Marissa (from New York) and Lara (from Paris via San Francisco) at Lambeth North and we set off on a practice walking tour. I’m glad we decided to do thins because there were some kinks in the walking route that had to be worked out. Lara and Marissa were such troopers! We had to stop and run into a pub several times because of the stormy weather. By the time we got to Sloane Square we were soaked through (poor TOM’S shoes). 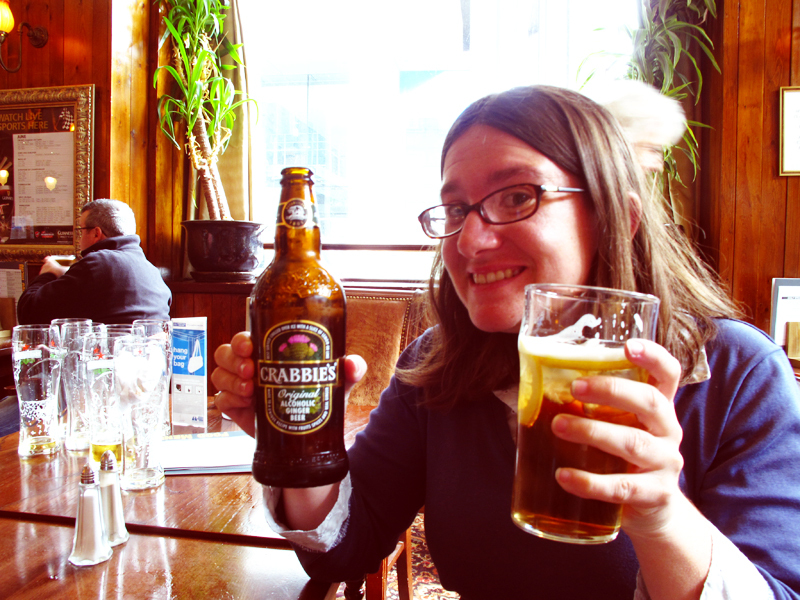 I was glad to introduce my new American friends to my favorite alcoholic pub beverage: Crabbie’s ginger beer. 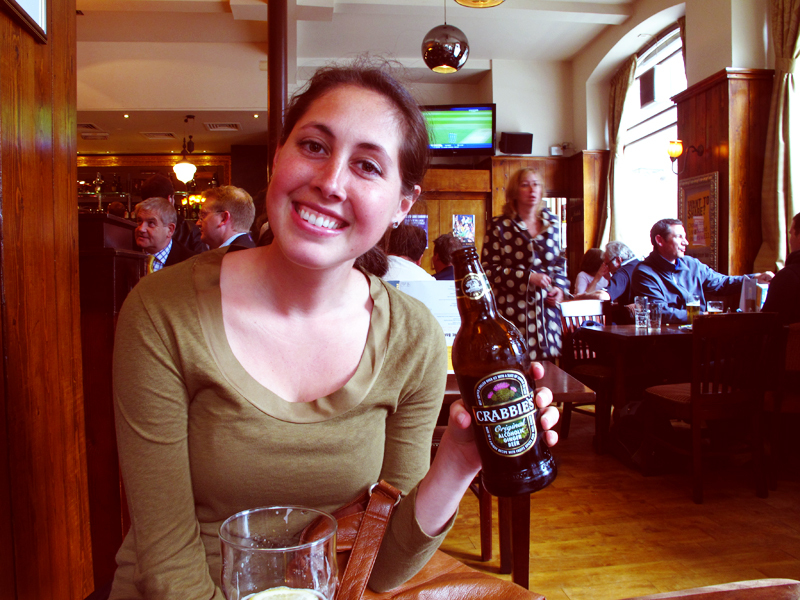 Marissa (from New York) advertising Crabbie’s ginger beer. 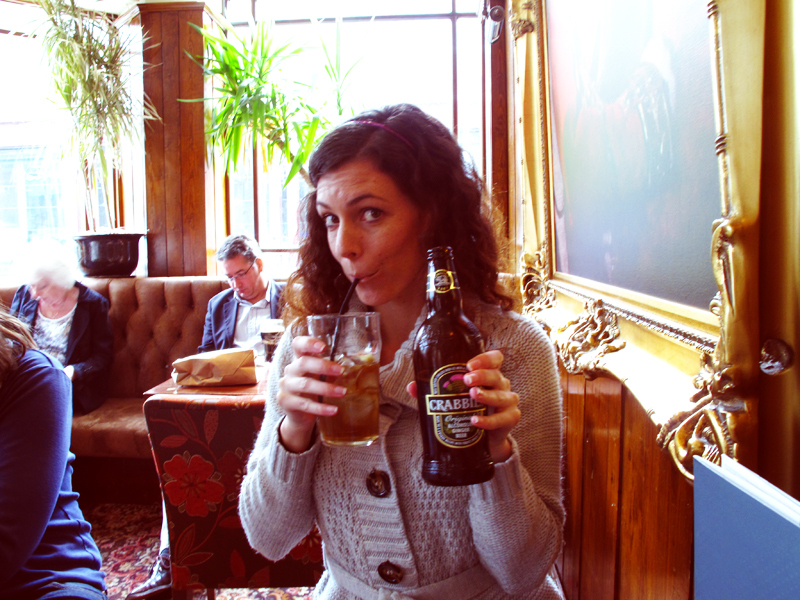 Hell, Crabbie’s is basically the only thing I drink. If a pub doesn’t have Crabbie’s I really don’t want to be there. On Friday, we had our first round of Old Vic tours. A small group of us met in the foyer in the afternoon and followed our amazing tour guide, Ned, around the building to catch a glimpse of the space where so many legends (including Larry and Vivien) have worked. As most people from this tour came back on Saturday for the big official tour, I’ll call this the practice tour. The practice tour went so well that we decided to stop in the Wellington near Waterloo Station for a drink before heading to Embankment for our group dinner at Lupita. Lupita, located just between Charing Cross and Embankment, is one of the only restaurants in London that serves authentic Mexican food. I had a steak burrito and it was delicious. So were the margaritas and the churros. Everyone seemed to have a great time chatting with people they’d just met. 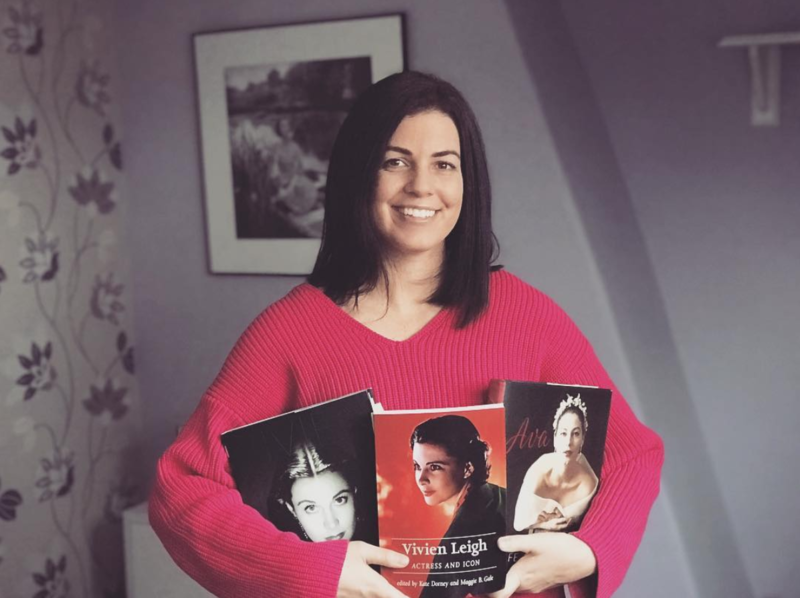 Robert (from London and a trustee of the Noel Coward society) and Chloe (also from London) both brought some beautiful stills to share with everyone. After a hearty meal, we all headed back to wherever we came from to recharge the batteries for the official start of the event on Saturday morning. I’m so happy to hear it went well, Kendra! Looking forward to part 2! Thanks, it went really well!! It sounds fascinating. I’m pea-green with envy. Sounds like a great time was had by all! The pictures are wonderful, please keep them coming! Cannot wait to hear more!!! There are plenty more photos and stories to come!! CRABBIE’S!! Oh Kendra dear, if ONLY I could have been there!! Am insanely jealous of all who got to participate in this truly marvelous excursion! Thanks for sharing the photos (especially that darling photo of you sipping Crabbie’s) and, more to the point, thank you for making the Olivier weekend a possibility!